Utopia Kitchen's Nonstick Frying Pan is formed with multi-layer nonstick for ultra-durability. The spectacular, modern design looks elegant in the kitchen, and it’s designed in such a way as to ensure even heat distribution. 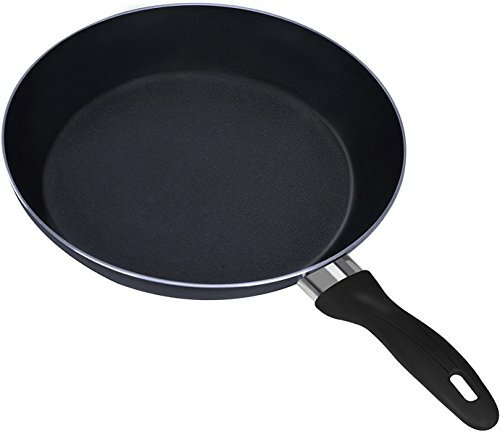 Its thick and flat bottom with gently sloping sides make it a highly versatile pan and perfect for preparing omelets, sautéed vegetables, and more. The Nonstick Frying Pan is made using top rated 3003 aluminum alloy which is used in professional grade frying pans. The two-layer nonstick interior is exceptionally durable with double coating and scratch resistance, making it safe for use with metal utensils. The Bakelite handle offers a heat-safe and comfortable grip for handling convenience. The handle retains shape and resists scratching over time. The pan is oven-safe up to 350 degrees Fahrenheit. It has a spiral bottom for even cooking, and it’s safe for all cooking methods.